After a first episode of pulmonary embolism (PE), two major problems need to be considered: risk of recurrence when anticoagulation is stopped, and risk of chronic thromboembolic pulmonary hypertension (CTPH). We followed prospectively consecutive patients who survived a first episode of PE, with or without deep vein thrombosis, to assess the incidence of venous thromboembolism (VTE) recurrences and of symptomatic and asymptomatic CTPH. After 3–6 months of oral anticoagulant therapy (OAT) patients underwent transthoracic echocardiography for measuring transtricuspid (rV-rA) gradient. When rV-rA gradient was >35 mmHg further evaluations were performed to rule in or out CTPH. During follow-up patients who developed persistent dyspnea were re-evaluated. 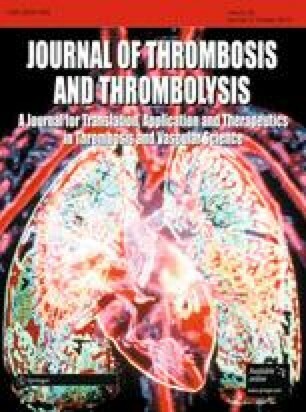 In patients who underwent OAT withdrawal D-dimer (DD), prothrombin fragment 1 + 2 (F1 + 2), and thrombophilia were evaluated one month after warfarin discontinuation. Overall, 239 patients, 118 males, median age 59(16–89) years, were followed up for a median time of 36(9–192) months. Nine patients had rV-rA gradient >30 mmHg and ≤35 mmHg, and one of 37 mmHg. Among patients with normal rV-rA gradient, one developed persistent dyspnea 55 months after the first event and CPTH was confirmed. Among 206 patients who stopped OAT, 23(11.2%) had VTE recurrence, 11 PE(48%). Elevated DD and F1 + 2 levels after stopping OAT were significantly associated with recurrence. None of patients with recurrent VTE had elevated rV-rA gradient. In our series the incidence of CTPH after a first episode of PE was 0.4%. VTE recurrence and elevated DD and F1 + 2 levels seemed not to be related to the development of CTPH.